From Baker Beth comes this month's cookie, just in time to celebrate Easter. We've all seen and probably will partake of our share of brightly pastel frosted, egg shaped, sugar cookies. Believe me, I'm on that mission, especially when the frosting is real buttercream, soft and not too sugary. But our Beth, being Beth-Like, isn't content being just your average bear. So, she brings us this cookie recipe for Easter. Think of it as a great palette cleanser to all the store bought Holiday candy and cookies. 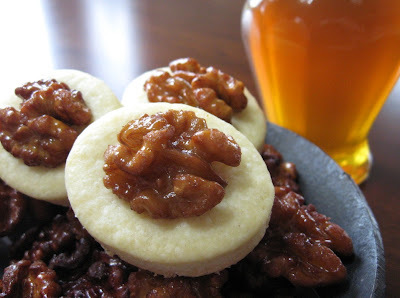 April 24 is Greek Orthodox Easter so April seemed like a fine month for a cookie that involves the genius Greek pairing of walnuts and honey – don't even get me started on my love of baklava! – and flaky pastry with a hint of cheese. The candied walnuts require a bit of effort, but they're well worth it. And the cookie dough is so ridiculously easy, the walnut step and the cookie step balance each other out. Aw, "your Beth" is blushing!